When insulating your home, there are many types of insulation to choose from. A professional contractor can help you choose the best insulation based on where you need to add/install insulation and the recommended R-values of the areas you want to insulate. Another reason to insulate now, regardless of the season, is that doing so will prepare your home for when you decide to upgrade (or must replace) your HVAC equipment. It makes little sense to install a new furnace, boiler, or central AC system until you’ve brought your home’s insulation levels to the R-levels recommended by the Department of Energy. The payback on every dollar spent on conservation is much quicker than for dollars spent on HVAC equipment, regardless of how efficient it is! Regardless of the time of year or where you live, upgrading your HVAC system and insulation improvements go hand in hand. If you are contemplating a new furnace or central air conditioning system, let Global Dwelling maximize your insulation first. It's smart to have your insulation inspected and to make the necessary improvements to your insulation before upgrading your HVAC equipment. Otherwise, you may end up buying more capacity than you need -- and cause your new HVAC equipment to run at lower efficiencies than projected by the manufacturer. We are Albany County's experts when it comes to maintaining a comfortable, energy-efficient home. 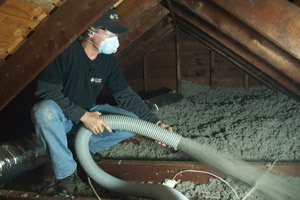 We know the right type of insulation to install and where to install it. We can also replace your old heating and cooling system with an energy-saving option.